Whiteflies | Infonet Biovision Home. 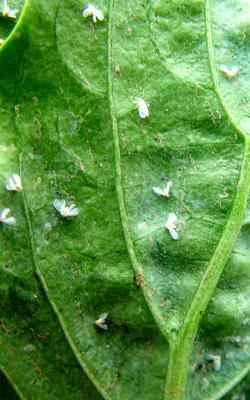 Adults and immature stages of the cabbage whitefly (Aleyrodes proletella). Whiteflies on chilli leaf. Adults are about 1mm long. 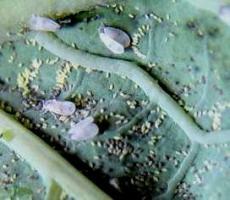 Adults and eggs of the cabbage whitefly (Aleyrodes proletella). 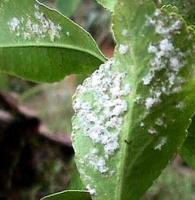 Whiteflies on citrus leaf. Adult are about 1mm long. The tobacco whitefly ( Bemisia tabaci) adult (bottom right) about 1 mm long, beside two Trialeurodes vaporariorum adults. (c) Ian D. Bedford. Reproduced from Crop Protection Compendium, 2004 Edition. (c) CAB International Publishing. Wallingford, UK. Silver leaf on squash ( Bemisia tabaci ) Close observation of the undersides of the leaves will show the tiny yellow/white larval scales and in severe infestations, when the plant is shaken, numerous small white adult whiteflies will flutter out and quickly resettle. These symptoms do not differ appreciably from those of Trialeurodes vaporariorum, the glasshouse whitefly, which is common throughout Europe and also occurs elsewhere. Tomato plant infected with Tomato Yellow Leaf Curl. Note upward and inward rolling of the leaf margins. (c) Ian D. Bedford. Reproduced from the Crop Protection Compendium, 2005 Edition. CAB International Publishing, Wallingford. Whiteflies cause direct damage to plants by sucking plant sap and removing plant nutrients, thereby weakening the plants. Damage may be more severe when plants are under water stress. In addition, they often produce large quantity of honeydew that leads to the growth of sooty mould on the lower leaves, blocking or reducing the photosynthetic capacity of the plants. The honeydew also contaminates the marketable part of the plant, reducing its market value or making it outright unsaleable. Infested plants may wilt; turn yellow in colour, become stunted or die when whitefly infestations are severe or of long duration. Whiteflies are also serious indirect pests as vectors of virus diseases. Bemisia tabaci transmits serious virus diseases on cassava, cotton, tobacco, tomato, beans, chillies, and sweet potatoes. Whitefly transmitted viruses are among the most serious virus diseases on plants; Virus infection often results in total crop losses. This whitefly is the vector of a range of leaf curl disease-inducing virus, in Eastern and Southern Africa, including Tomato Yellow Leaf Curl Virus, the African Cassava Mosaic Virus, Cowpea Mild Mottle Virus, Watermelon Chlorotic Stunt Virus among others. The African Cassava Mosaic Virus is one of the most important factors limiting cassava production in Africa. In sweet potatoes B. tabaci transmits the Sweet potato Chlorotic Stunt virus, which together with the aphid-transmitted Sweet potato Feathery Mottle Virus causes the Sweet potato virus Disease, the most important disease constraint to sweet potato production in Sub-Saharan Africa (Legg et al., 2003). The tobacco whitefly (Bemisia tabaci) and the greenhouse whitefly (Trialeurodes vaporariorum) attack a very wide range of wild and cultivated plants. Bemisia tabaci is the dominating whitefly in the region. Its host range includes cotton, tobacco, vegetables (tomatoes, eggplant, okra, bell peppers, cucurbits, etc. ), legumes (beans, soybeans, cowpeas and groundnut), tuber and root crops (sweet potato, cassava, potato) among others. The host range of Trialeurodes vaporariourm is similar to the one for Bemisia tabaci, but the former usually occurs at higher altitudes and cooler climates than B.tabaci. Trialeurodes vaporariorum attacks many plants grown under protected conditions (greenhouses) in temperate countries, the most severely affected crops are aubergine, cucumber, beans, sweet peppers, tomatoes and a large number of ornamentals. The status of this whitefly in field grown crops in the region is not clear. 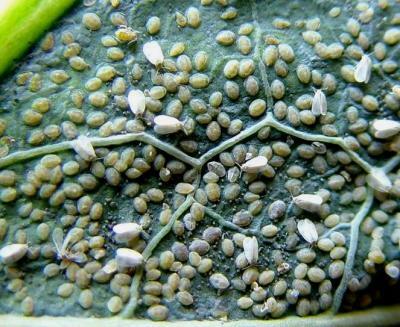 The cabbage whitefly (Aleyrodes proletella) is a pest of Brassicas but rarely reaches levels that require intervention. The citrus woolly whitefly (Aleurothrixus floccosus) is found mainly on citrus plants, but also attacks coffee (arabica), guava, eggplant, aubergine, mango, and several wild plants. The spiralling whitefly (Aleurodicus dispersus) feed on many plants. In West Africa, it has been observed causing damage on many food crops, including cassava, soybean, pigeon pea, citrus, papaya and others. 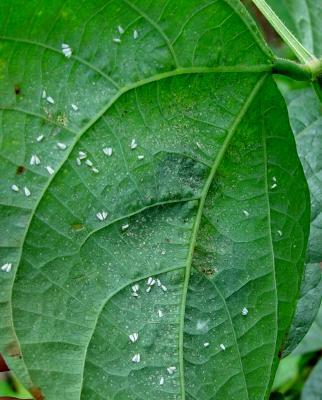 This whitefly has also been recently found in East Africa. 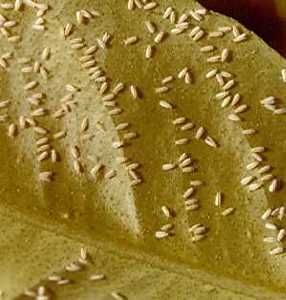 Feeding of whiteflies causes yellowing of infested leaves. Whiteflies excrete honeydew, a clear, sugary liquid. This honeydew covers the lower leaves and supports the growth of black sooty mould, which may coat the entire plant. 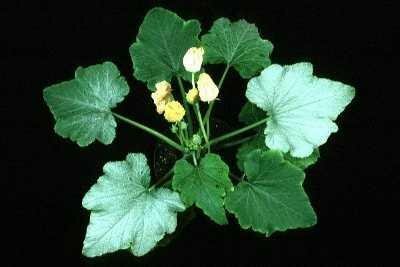 Where plant viruses are transmitted plants show the typical symptoms of the virus diseases. Presence of whiteflies can also be recognised by a cloud of tiny whiteflies flying up when the plants are shaken. The whiteflies resettle soon on the plants. Leaves: honeydew or sooty mould. Eggs are tiny (about 0.2 mm long) and pear-shaped. They stand upright on the leaves, being anchored at the broad end by a short stalk inserted into the leaf. They are laid usually in arcs or circles, on the undersides of young leaves. Eggs are whitish in colour when first laid, but gradually turn brown. 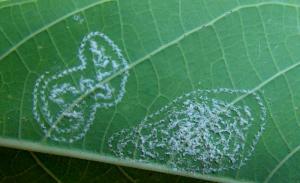 Some whiteflies deposit large quantity of wax around the eggs in the form of a loose spiral like a fingerprint. Hatching occurs after 5 to 10 days at 30degC depending on species, temperature and humidity. On hatching, the first instar or crawler is flat, oval, very small (barely visible even with a hand lens) greenish-white in colour. It is the only mobile immature stage. It moves to a suitable feeding location on the lower leaf surface where it settles. It moults, loosing the legs and antennae, and cannot move throughout the remaining immature stages. They pass through two additional feeding stages, known as nymphs. The nymphs are usually oval or oval-elongate in shape, and are simple in appearance like small scale insects. Nymphs of many species produce waxy secretions around the margins and the dorsal surface of their body. The last (fourth) immature stage is known as puparium. In this stage the metamorphosis to adult occurs. The red eyes of the adult developing inside are visible through the skin (integument). As the other larval instars it is greenish in colour and is scale-like, but becomes more bulky shortly before the adult emerge. They are usually found on mature leaves. The adult emerges about 6 days after pupation. It usually emerges through a T-shaped split in the dorsal surface of the pupal case. The total nymphal (immature) period last 2 to 4 weeks depending to temperature. Large populations may develop within 3 weeks under optimum conditions, and the lower leaf surfaces may be almost covered by immature stages. Tobacco whitefly Bemisia tabaci adult (bottom right) about 1 mm long, beside two Trialeurodes vaporariorum adults. Adults are small (1 to 3 mm long), with two pairs of wings that are held roof-like over the body. They resemble very small moths. Their body is pale yellow. The body and wings are covered with a powdery, waxy coating. 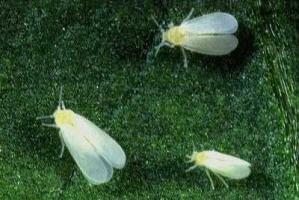 Whiteflies are mostly white, but can also be yellowish and some species have dark or mottled wings. They have sucking mouthparts. They are often found clustered in groups on the underside of young leaves and readily fly away when disturbed. A female may live for 60 days; life of the male is generally much shorter (9 to 17 days). Whiteflies adults do not fly very efficiently, but once airborne can be transported long distances by the wind. All stages of the pest, but particularly the immature stages (which are small and easily overlooked) are likely to be carried on plant materials. These illustration shows the methods promoted on infonet-biovision. The methods shown at the top have a long-term effect, while methods shown at the bottom have a short-term effect. In organic farming systems, methods with a long-term effect are the basis of crop production and should be used with preference. On the other hand methods with a short-term effect should be used in emergencies only. On infonet we do not promote synthethic pesticides. Further below you find concrete preventive and curative methods against Whiteflies. For early detection inspect for adults and eggs. They are usually found on young leaves. Watch out for whiteflies flying up when the crop is disturbed. It is important to identify the whitefly and the type of damage caused, as well as the stage of the crop for making decision. Small numbers of whiteflies do not cause major direct plant damage to healthy, mature plants and therefore do not justify any chemical intervention. Control measures can be justified if large numbers of whiteflies are present during the early stages of the crop. However, where virus transmission is involved, as is the case of the tobacco whitefly on tomatoes, sweet potato or cassava, even small numbers of whiteflies may need to be controlled. Yellow sticky traps can be used to monitor the presence of whiteflies for timing of interventions. See more on section on traps below. The following description helps to distinguish the most important whitefly species in Africa: However, for authoritative identification contact the Entomology Department of the National Museums of Kenya. Adults of the tobacco whitefly (B. tabaci) have wings all white in colour, and hold them tent-like over the body, giving a narrow, triangular, appearance while other whiteflies usually hold their wings flatter, which give them a flattened appearance. The larval stages and puparium of this whitefly are naked (not covered with waxy white material). They appear as pale yellow oval specks to the naked eye. On a closer look they are oval and flat with a rounded outside margin, tapering toward the leaf surface as viewed from the side. In contrast, the pupae of the greenhouse whitefly have distinctly ridged outside margins with flat, vertical surfaces surrounded by short threads. The wings of the greenhouse whitefly (Trialeurodes vaporariorum) are completely white, while the cabbage whitefly (Aleyrodes proletella) has dark flecks on the wings. 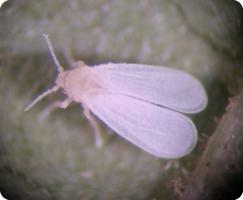 Adults of the citrus woolly whitefly (Aleurothrixus floccosus) have wings all white in colour. Eggs are in a circle or half a circle. The immature stages are covered by abundant, dirty-looking, flocculent white wax, which gives them a woolly appearance. 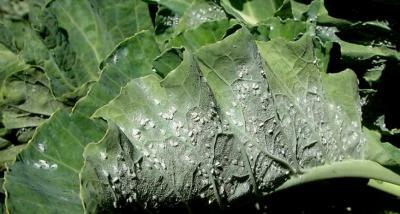 They usually form large dense colonies covered with cotton-like secretions on the lower leaf surface. Adult of the spiralling whitefly (Aleurodicus dispersus) are white, although pale or dark spots may occasionally occur on the forewings. 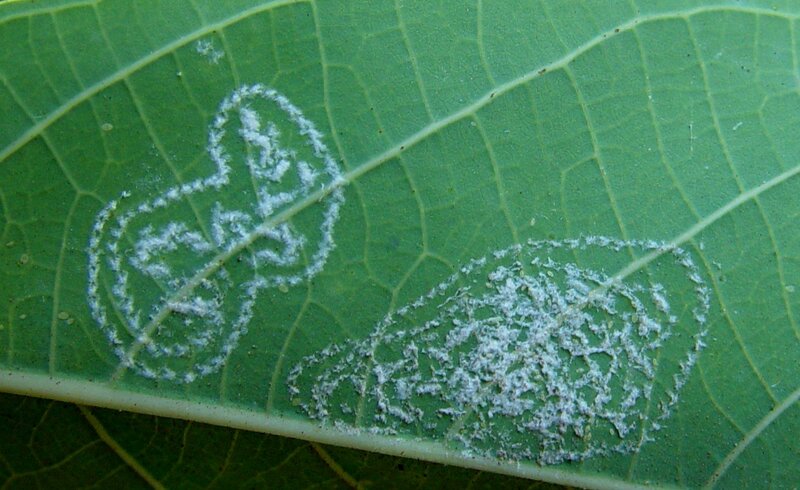 Eggs are laid on the lower leaf surface in characteristic spiral patterns, resembling fingerprints of white material secreted by the female. Nymphs and adults produce considerable amount of white wax. When the adults move around they leave behind a trace of waxy material. 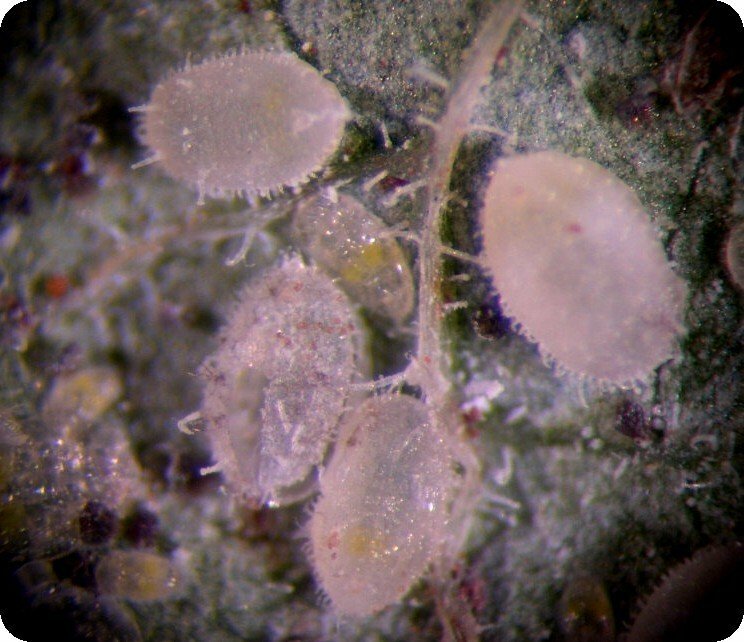 They usually form dense colonies on the lower leaf surfaces. Ensure adequate growing conditions for the crop such as good soils, adequate water supply, proper feeding (avoid application of high doses of nitrogen fertiliser, since it favours development of the pest), proper spacing and good nursery management to start the crops with healthy, vigorous plants. If the plants are to be raised in a seedbed and later transplanted like many vegetables, keep the seedlings protected under a fine meshed insect netting until they are ready for transplanting. Make sure the netting is always properly closed. Selection of crops for intercropping can be used to manage whitefly populations. For instance, interplanting tomatoes with capsicum or cucumber has reduced whiteflies numbers when compared with tomatoes alone or tomatoes planted with eggplant or okra. Planting of border rows with coriander and fenugreek, which are non-host of B. tabaci, will serve as windbreaks, and are favourable for natural enemies and also repellent to whiteflies. Growing African marigolds and nasturtiums has been reported to discourage whiteflies. Avoid the season when whiteflies are more likely to occur. Growing resistant varieties is particularly useful for the management of diseases caused by viruses transmitted by whiteflies, in particular, B. tabaci. Outbreaks of African cassava mosaic virus (CMV) in East Africa are associated with the varieties grown and are less devastating in areas where many different varieties are grown. The outbreak of ACMV in East Africa has been contained by farmers adopting resistant varieties introduced from Nigeria (IITA) or those selected by the National Agricultural Research Organisations from the available local varieties. Resistant varieties introduced from Nigeria include "SSA"," Nase 1", "Nase 2", and "Nase 3" (Migyera) (OFDA-CMD Project). For more information on African cassava mosaic virus click here. Tomato varieties resistant to TYLC virus are also available from AVRDC and can be bought in Tanzania and Kenya. For instance the varieties "Fiona" and "Tyking" are resistant to TYLCV in Tanzania. 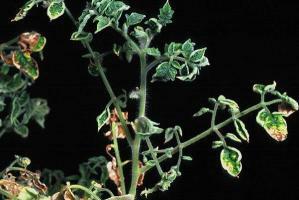 For more information on tomato yellow leaf curl virus (TYLCV) click here. Weeds play an important role in harbouring whiteflies between crop plantings. They also often harbour whitefly-transmitted viruses. Therefore, weeds should be removed in advance of planting. Fields should also be kept weed free. Whiteflies are attacked by a large number of natural enemies: parasitic wasps (e.g. Eretmocerus spp., Encarsia spp. ), predatory mites (Amblyseius spp. and Typhlodromus spp. ), predatory thrips, lacewings, rove beetles and ladybird beetles. The dusty lacewing Conwentzia africana is considered to be one of the most important predators of B. tabaci in East and southern Africa (Legg, 2003). Parasitised pupae can be recognised by the black colour of the puparium, and later, when the parasitic wasp has emerged, by an irregular round hole on the puparium, which is chewed by the emerging wasp. Parasitic wasps are very important for control of whiteflies. Encarsia formosa in particular, has been widely used for control of whiteflies worldwide. Two parasitic wasps Encarsia guadaloupe and Encarsia haitiensis have provided control of the spiralling whitefly an introduced pest in West Africa (Neuenschwander, 1998; James, et al, 2000). Several fungi (e.g. Verticillium lecanii, Beauveria bassiana, Paecilomyces fumosoroseus) attack whiteflies and can be useful control agents in situations where the crop is grown in high humidity conditions. Commercial preparations are available. Natural enemies commercially available in Kenya include the parasitic wasp Encarsia formosa, produced by Dudutech and registered as Encartech(r), and the pathogen Beauveria bassiana sold under the trade name Bb plus(r) by Juanco SPS Ltd.
Mortality of whiteflies by natural enemies is particularly important in crops where feeding damage is the cause of losses, rather than virus transmission. In cases where the whiteflies are vectors of virus diseases, control provided by natural enemies is generally not sufficient to prevent virus spread and transmission. Neem-based pesticides are reported to control young nymphs, inhibit growth and development of older nymphs, and reduce egg laying by adult whiteflies. They also reduce significantly the risk of Tomato Yellow Leaf Curl Virus transmission. Efficacy of neem-based pesticides can be enhanced by adding 0.1 to 0.5% of soft soap. Yellow sticky traps usually used to monitor the presence of whiteflies for timing of interventions, have also been used as a control method for low density infestations in enclosed environments. Yellow plastic gallon containers mounted upside down on sticks coated with transparent automobile grease or used motor oil. These should be placed in and around the field at about 10 cm above the foliage. Clean and re-oil when traps are covered with flies. Yellow sticky boards. To use, place 1 to 4 yellow sticky cards per 300 square metre field area. Replace traps at least once a week. It is difficult to determine the population of newly trapped whiteflies on a sticky card from the previously trapped ones. To make your own sticky trap, spread petroleum jelly or used motor oil on yellow painted plywood, 6 cm x 15 cm in size. Place traps near the plants but faraway enough to prevent the leaves from sticking to the board. Traps when hung should be positioned 60-70 cm above the plants. Flour/Starch preparation has been listed by several authors as successful against whiteflies. Ensure the spray reaches the underside of the leaves, where the whiteflies like to hide. For more information on Flour spray click here. Plastic covers and mulches. Preventing physical contact of the whiteflies with the plant can prevent the transmission of virus diseases. This can be done by using plastic covers and mulches and by cultural methods. Several cover crops (forage, peanut, weeds) and inert covers (silver, yellow, and white/black plastic mulches) have been shown to reduce whitefly damage in tomatoes. However, when using plastic covers, care should be taken to avoid sunscald see also on tomato page. This is effective as long as the plants are young and do not cover the mulch. The whiteflies will be more attracted by the colour of the plastic mulch. The heat of the plastic kills the whiteflies. The protection can last for 10 to 20 days after transplanting and about 30 days after direct seeding. Covering tomato seedling nurseries with nylon nets or use of tunnels for 3 to 5 weeks protects seedlings from whiteflies infestation. These methods have been reported to reduce the transmission of the Tomato Yellow Leaf Curl Virus in several countries. 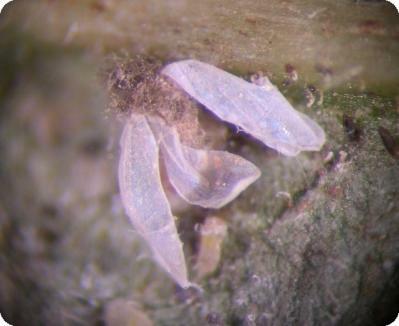 Spraying with soap and water reportedly controls whiteflies. However, care should be taken, since the use of strong soaps, or soft soaps at high concentrations can scorch the plants. For more information on Soap spray click here. Legg, J., Gerling, D., Neuenschwander, P. (2003). 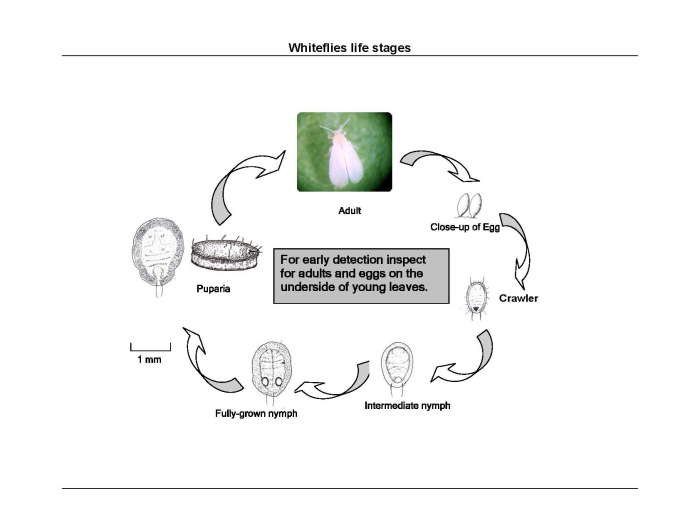 Biological Control of Whiteflies in Sub-Saharan Africa. In Biological Control in IPM System in Africa. CAB International. ISBN: 0-85199-639-6. Mound, L.A. and Halsey, S.H. (1978). Whitefly of the World. British Natural History Museum.. ISBN: 0-471-99634-3.